1. To make the intention of Wudu before you begin. 2. To say “Bismillah” before you begin. 3. To wash the hands up to the wrist 3 times. 4. To gargle the mouth. 5. To wash the nostril. 6. To use Miswaak to clean the teeth. “Miswaak” is a special tooth-brush made from the roots of certain trees. 7. To make Wudu in the correct sequence. 8. To wash all parts immediately one after the other. 9. To wash all parts 3 times. 10. To make Masah of the ears. 11. To make Masah of the whole head. 12. To make “Khilal” of the beard (pass wet fingers through the beard). 13. To make Khilal of the fingers and toes (pass wet fingers in between the toes and fingers). When does Wudu become Makrooh ? 1. To make Wudu in a dirty place. 2. To cleanse the nose using the right hand. 3. To talk of worldly things while making Wudu. 4. To perform Wudu in any sequence, for example, to wash the feet first then the face. 6. To use too little water so that certain parts are not washed properly. 7. To splash water on the face. 8. To ask someone for help in making Wudu without a proper reason. 1. To face the Qiblah. Remember that you should not spit towards the Qiblah. 2. To make Wudu in a clean place. 3. To read “Bismillah” before washing each part. 4. To read the proper Du’as when washing each part. 5. To wash each part from the right side. 6. To shift or to remove rings or bangles and to let the water pass under these objects. 7. To clean the nostrils with the left hand. 8. To clean the inside of the ears. 9. To read the Du’a and the Kalimah Shahaadah after Wudu and to also read Surah Qadr facing towards the sky. 1. Any discharge from one’s private part, for example urine, stool, wind, or any substances. 2. When blood, pus or any matter flows out from a cut, wound, sore or pimple. 3. When one vomits a mouthful. 4. When one falls off to sleep while leaning or lying down. 5. When one becomes mad, faints or gets epileptic fits. 6. Laughing aloud in Salaah. 7. The spitting of blood, if the blood is more than the saliva. 8. When one becomes drunk or looses ones frame of mind either through drinking alcohol or taking drugs. When is it Mustahab to make Wudu? 1. When one awakens from sleep. 2. Before every Fard Salaah, even if one already has Wudu. 3. When one becomes angry. 4. When reading the Holy Quran from memory (Hifz). 5. When listening to Islamic lectures and when learning or teaching Islam. 6. When giving Azaan or Takbeer or when delivering the Khutbah. 7. When visiting sacred places like the Mazaars of the Awliya Allah. 8. When making Wuqoof on the plains of Arafaat on the 9th of Zil Hajj. 9. When making Sa’ee between Saffa and Marwa. 10. After backbiting and after committing a sin. 11. When visiting the grave-yard. 1. By removing the bandage or plaster causes pain. 2. Water is harmful to the wound. 3. Water lengthens the healing process. 1. Carry or touch the Holy Quran that is without a proper cover. 4. Perform the Sajdah Tilaawah. 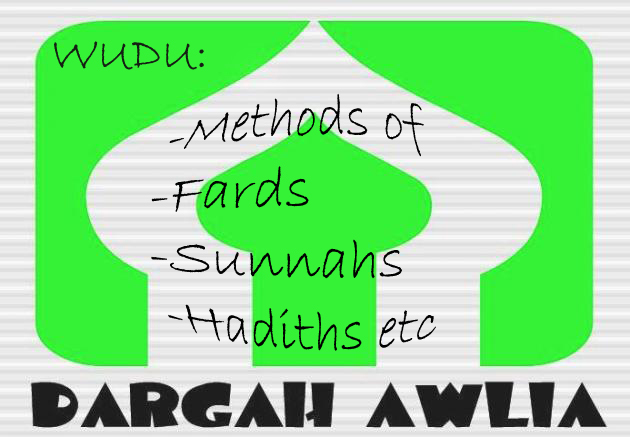 Basics of Wudu,brought to you by Dargah Awlia!! For more articles,visit the archives collection for articles on a islamic monthly basis and others!! !